I can’t believe I’m already writing my second blog post of the summer. It’s crazy how fast time goes when you’re having fun! As the fifth week of MSBA and the World Cup comes to an end, I find myself reflecting on everything I’ve learned this summer, not just from MSBA, but from all the people I’ve met and experiences I’ve had along the way. This week was a long one, I won’t lie. As a Federer fan and a Brit, Wednesday was a particularly tough day … I watched Federer lose from two sets up and England lose in overtime after being up within the first five minutes and missing multiple chances in the first half. The thing with sports is sometimes you can’t help but get much too emotionally involved, and a big loss from your team can completely ruin your day. However, the feeling and joy you get when your favorite team or player wins is always worth dealing with the losses. Today, I watched France win the World Cup in a little sports bar in the middle of Times Square and for a short time I wasn’t thinking about the business of sports or my career, but rather just watching and enjoying the game, and it reminded me why I wanted to get into sports in the first place. We were a group of strangers all sitting in a small bar together eating fries and screaming at the television, and there is a connection there that you don’t get in anything else. 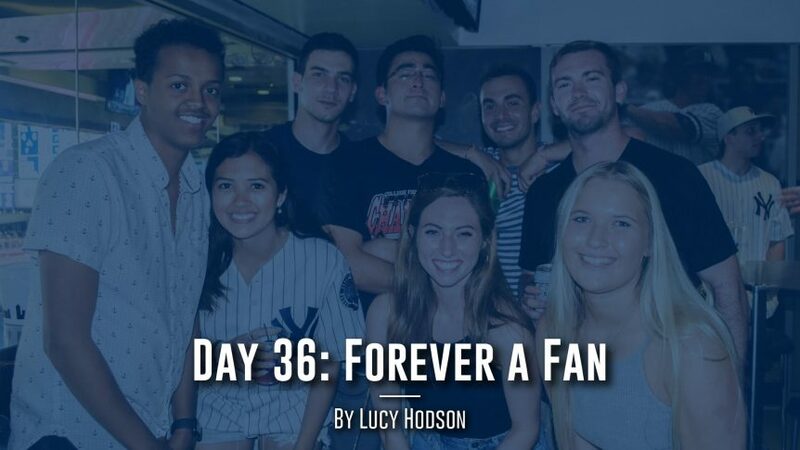 Being a sports fan and watching a game with other fans – whether it is at the stadium or on TV – brings with it an amazing camaraderie, which is the reason I loved sports in the first place. I think that with everything we have going in New York, a day like today was awesome and much needed to remind me where my passion for the industry came from and why I love it so much. I love first and foremost being a fan, and I think that something I need to remember when I start my career is that the fans are the most important and best part of sports. Although I am starting to see many different areas of the industry and meet lots of different people from within it, there is one thing that we all have in common: we all started as fans. So I will continue to be upset whenever Federer loses, because without this level of investment into sports I wouldn’t be the person I am today. My emotional connection to sports as a fan is what makes me so passionate and determined when pursuing my career within the industry, and I am so thankful to have something that I enjoy being a part of this much.